Heavenly blog! : No. 876: Blessing and the necessity to give to God's church and the Lord's Apostle! No. 876: Blessing and the necessity to give to God's church and the Lord's Apostle! Blessing and the necessity to give to God's church and the Lord's Apostle! Know that money always comes to creating a certain friction. But God's word speaks volumes about giving, both Old and New Testament. But Jesus said that there is a greater happiness to give than to receive! This also makes it donor service as large and necessary ?! Acts 20. 35 I've always held out to you that we need to work in this way and take care of the weak. Remember the words the Lord Jesus himself said: 'It is more blessed to give than to receive.' 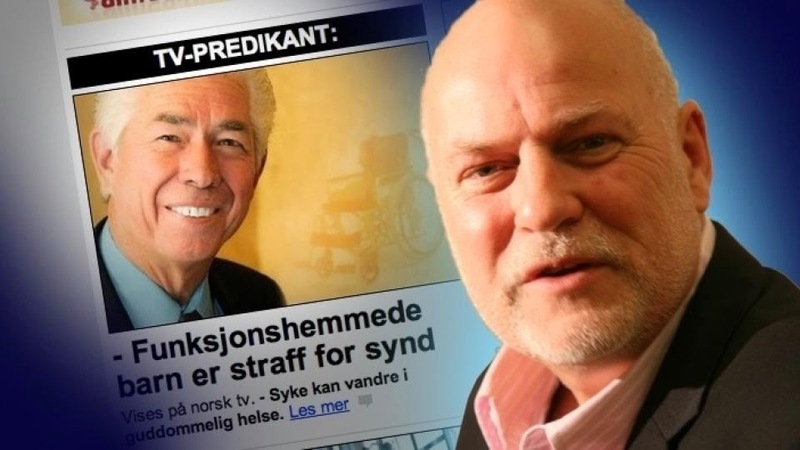 "
Image of "Pastor" Jan Kaare Hanvold gives you the Vision Norway. So you do not give to God or his work when Hanvold live in sin and is a heretic. You simply maintain the sins of this world and you will not get wages back of the Lord. But you support Smyrna Oslo and my service, you will get big salaries back of the Lord, not least in front of Christ court! Have you got pleasure of a message, then it is right and spiritually to give money back! Rom. 15. 25 But now I go to Jerusalem with the help of the saints there. 26 For the churches in Macedonia and Achaia have decided that they will collect a gift to the poor among the saints in Jerusalem. 27 They have even decided this and stands well in a debt to them. They owe to help them with material gifts when they, like the Gentiles have shared in their spiritual gifts. 28 When I have completed this and the fruits of the collection is well preserved with them, I travel to Spain and adds way about you. 29 And I know that when I come to you, I will come with a wealth of Christ's blessing. This can of course be misunderstood, and some may take this to one extreme. But has anyone given you their spiritual riches, which have not come free. So give back, you can do this by asking for that, speak well of that person and give money. The Apostle Paul says, "to help them with material gifts when they themselves, as Gentiles have shared in their spiritual gifts." For the apostle was so, he he and others have been blessed, it was right and proper to give back things. Have you done this and practice this? Biblically it is at least to give back, also in terms of money! 2 Cor. 8. 1. We will now make known to you, brethren, how great grace God has shown the churches in Macedonia. 2 For their trouble, they were sorely tested, but their exuberant joy and deep poverty has made them rich and willing to give. 3 They gave according to their ability, yes, of ability and volunteer, I can attest. 4 They prayed earnestly to join the gift and serve the saints with us. 5 And they gave not only the way we hoped, but they gave themselves first to the Lord and then to us, as God wants it. 6 So we asked Titus to finish the gift that he had already begun with you. Here we see an important principle and truth. It's never how much or little we have. How many resources or how few resources we have, but that we start teaching us to give. God bless us always from what standpoint we have today, not from what standpoint we should have in the future. Therefore, it is about making learning to give, if we have a lot or a little. You learn not to give when you have little, it is doubtful you will give the day you would get much. Give today on the basis of the wealth you have! 7 ye abound of all: faith and speech, knowledge and eagerness of the love you from us. So you must also report this gift show their abundance! 8 I say this not as a command, but I mention the zeal of others to try if love is real with you. 9 You know our Lord Jesus Christ grace: though he was rich, he became poor for your sake, that you would become rich by his poverty. Jesus sacrificed everything for us, then it is not too much demand that we give back in the form of money to the servants whom the Lord has raised up and sent out. Here the apostle ever the same. Give today based on the precondition that you have, and God bless there from. And have you begun to proceed! 16 Thanks be to God who has aroused this zeal for you in the heart of Titus. 17 He said yes when I asked him, and was so eager that he now travels to you because he wants. 18 With him we are sending the brother who is praised in all the churches for his work for the Gospel. 19 Not only that, but he's also been chosen by the churches to travel with us and bring this gift, which we have been able to Lord honor and as a sign of our good will. 20 We want to avoid any criticism in connection with this huge amount we have handled. 21 For we will gladly do what is right, not only for the Lord, but also for humans. 22 Along with these two, we send another brother. We have often and in many ways seen examples of his zeal. He has great confidence in you, and therefore he is now even more eager to embark. Here is Paul on to something which is also important. Openness in connection with the giving, what the money is used. And how they should be used, etc. 23 As for Titus, remember that he is my helper and coworker with you. The other brothers are parishes envoys, in honor of Christ. 24 Give therefore congregations visible evidence of their love for them, and let them see that it is rightly we have praised you. Titus was a person as Paul proud entirely on (Titus letter is to this Titus was Pastor and Shepherd in Crete). How we use our money, says basically who we are. Therefore also donor service and how we manage our money, a spiritual service. 9.1. Actually it is not necessary that I write to you about the service for the saints, 2 for I know that ye are willing. Here in Macedonia I commend you and say that you in Achaia has been prepared since last year. And their zeal has inspired many. 3 Now I am sending these brothers to you, so it should prove that it was not empty words we came when we praised you for this, but that you are ready, as I have said. 4 I do not want that Macedonians should come with me and find you unprepared. For then would the whole measure only bring shame upon us - not to talk about you! 5 I found it necessary to ask these brothers travel to you in advance and in good time to prepare the gift you have given promise. Then, it can be done as a blessing and not as a gniergave. Luke 16. 9 I say to you: Get you friends using the dishonest Mammon, that they may receive you into everlasting habitations when the money runs out. Jesus himself says that we should use our resources in the best possible way that they will again bring salvation, blessing and spiritual wealth to others. That which we have taken part in! 6 But I say: He who sows sparingly shall reap sparingly, and he who sows with blessings shall reap blessing. 7 Each man should give what he has decided in his heart, not reluctantly or coercion. For God loves a cheerful giver. yes, abundance for every good work. God will reward everyone, get to give! 10 He who gives seed to the one to be so and bread to eat, he will also give you seed and let it carry liberally and allow their justice bear rich fruit. 11 Ye shall have plenty of everything, so you want to give. And so thanks rise up to God when we convey the gift. Luke 6 38 Give, and it shall be given you: A good measure, sammenristet, stuffed and brimming ye shall obtain lap. For the measure you use it will be measured back to you. " 12 For this service, this worship, is not only a means for the Saints in their distress; it also creates an abundance of thanks to God. 13 When you have faithfully completed service, they will glorify God because you were obedient and acquaintances you to Christ and wholeheartedly shared with them and with everyone. 14 And they will pray for you and yearn for you because God has given you this overwhelming grace. 15 Thanks be to God for his unspeakable gift! Like the word: "For this service, this worship service." It is part of our worship, the church members have the opportunity to give. It is not unspiritual to be a happy, good and happy giver. To Allah and God's church! 1 Cor. 16. 1. When it comes to the collection for the saints, you also should do as I have commanded the churches of Galatia. 2 First day of the week let each of you at his home put aside as much as you are able, that no collections first start when I come. Here we see what and how they did it among the first Christians. They gave after which they knew and had faith and ability to give! This I would encourage everyone to do, and do it now! Begin donor service today, not tomorrow!